Let me introduce myself, Gerianne Cygan, co-founder of The Exercise Coach®. My passion is nutrition, fitness and natural wellness. Together with my husband Brian, we hope to change the way people think about exercising, eating, and enjoying strength™. I am also a student at the Institute for Integrative Nutrition (IIN), where I’ve learned a great deal about the benefits of eating raw foods and incorporating more greens on a daily basis. While eating salads is a great way to eat all those raw veggies, I find I just can’t eat them every day. Plus, the ingredients for salads are freshest during the summer and not so tasty in the winter. And as for Brian and our kids, let’s just say that salads are not high on their “favorites” list. So this past Christmas, Brian bought me the one and only gift I truly wanted—a Vitamix! Yes, the jet-engine blender that pulverizes anything you put inside it. 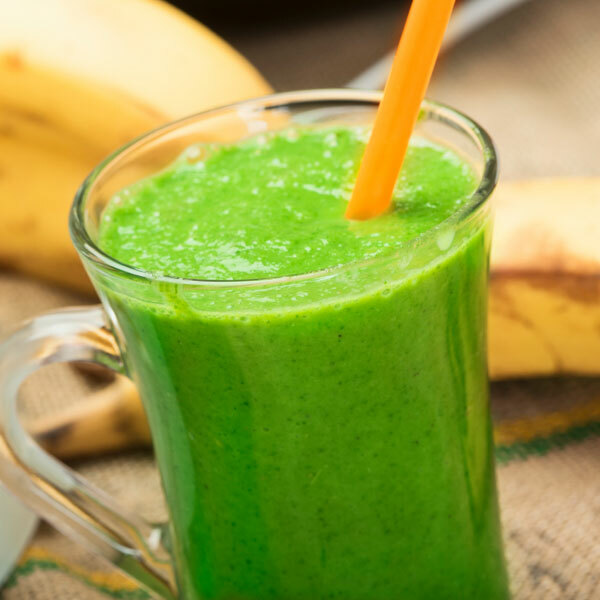 And…enter The Green Smoothie! Add about a cup of water and crushed ice and it’s time to let the Vitamix do its thing! Remember, you are not peeling anything here! All that healthy fiber is going to enter your body and do wonderful things for you! Tasting time. Yum! I generally sip on this throughout the morning or afternoon. My kids now crave it for breakfast every day. And, Brian has never eaten so many veggies in one sitting! Mission accomplished—large daily dose of raw veggies and fruits. I’d also recommend adding a scoop of vanilla Coach Fuel™ to make this a green protein smoothie. And, it never hurts to add a teaspoon of Vitamin C powder for that extra dose of antioxidants during cold and flu season. If you don’t have a Vitamix or if you prefer a machine that is budget-friendly – I recommend the Nutri-Bullet, a powerful personal blender that pulverizes your favorite fruits and veggies and costs only about $100. Check it out! What are you waiting for? Join our family and enjoy a daily Green Smoothie. You’ll be amazed at how quickly your body will crave the nutrients and love the increased energy. And, it’s really fun being a mad scientist every morning.